Some 50 years later, Kimball's words inspired a tiny band of LDS artists and writers to launch an audacious effort — to establish a center for Mormon arts in the Big Apple where novelists, musicians, painters and poets could showcase their work. "Mormon arts (visual arts, drama, film, music, dance, fiction, poetry) are resources to be cultivated for the good of our common enterprise," wrote LDS historian Richard Bushman, emeritus professor at Columbia University, one of the group's co-founders. "By situating Mormon arts in the contexts of other thought systems and histories, the center would be a bridge to Mormonism for people of diverse outlooks. No better place could be found for such a project than New York City, the art capital of the world." 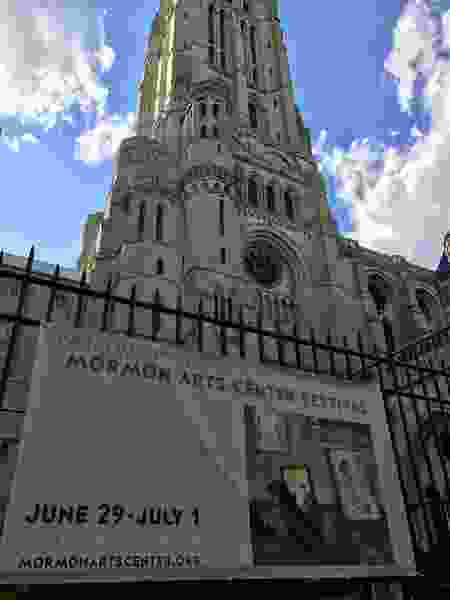 On Thursday, the Mormon Arts Center Festival opened in a small chapel and hall associated with the famed Riverside Church in Manhattan's Upper West Side. There were speeches, discussion groups and concerts — all beside a gallery of 23 works, mostly from the faith's permanent collection in Utah. Not surprisingly, the collection included devotional art of Jesus and some "uniquely LDS subject matter," she said, as well as pieces that explore "identity, particularly women's place within a larger dialogue." The sold-out gathering attracted hundreds of attendees from near and far, including Dieter F. Uchtdorf, second counselor in the faith's governing First Presidency, who attended with his wife, Harriet Uchtdorf, who is on the arts organization's advisory board, and their daughter, Antje. In his keynote address, LDS author Terryl Givens called the festival "a seminal event in Mormonism's coming of age artistically." The conference has been "a pretty amazing gathering — artists, scholars, patrons and fans," Kristine Haglund, former editor of Dialogue: A Journal of Mormon Thought, wrote in an email. It was "densely thoughtful ... and wide-ranging, from Michael Hicks' manifesto about the second coming of Mormon music to Jared Hickman's discussion of Joseph Smith's genius for sacralizing everything, to Glen Nelson's compelling and copiously researched portrait of a once famous, but now nearly forgotten, Mormon artist from the early 20th century." Gordon Smith, one of the church's area authorities, asked the financier to get involved, said Checketts, who described himself as "a passionate supporter of the arts." He readily agreed. He doesn't know how long it will take to build, he said, but "it's an idea whose time has come."